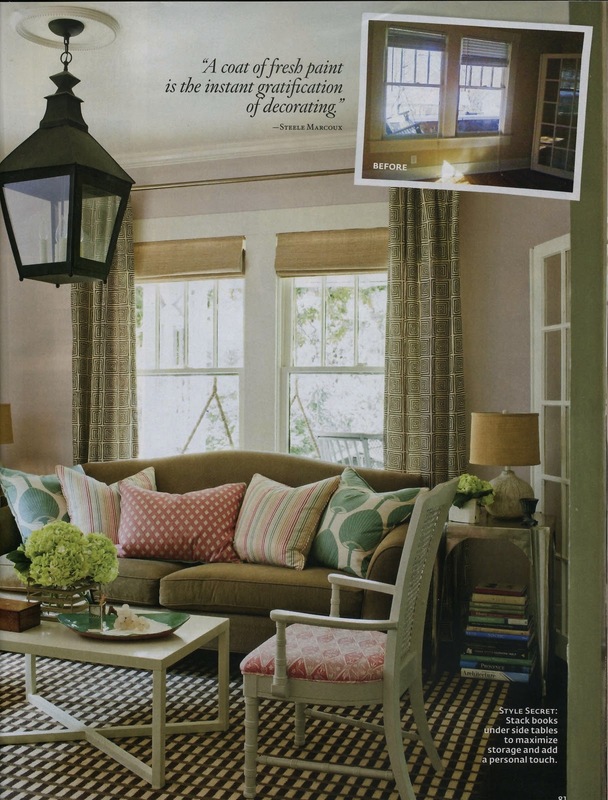 In the most recent issue of Southern Living, I was delighted to see a feature on Steele Marcoux's, Coastal Living's design editor, quirky but cheerful cottage. The thirty month remodeling project produced a stunning 1920's 1800 square foot cottage. Let's take a peek. So many things I love. Where to begin? I love the custom touch of the full-length lumbar pillow on her Lee Industries sofa. She seamlessly mixes high and low end furnishings by pairing her Lee Industries sofa with a West Elm jute rug and Target coffee tables. 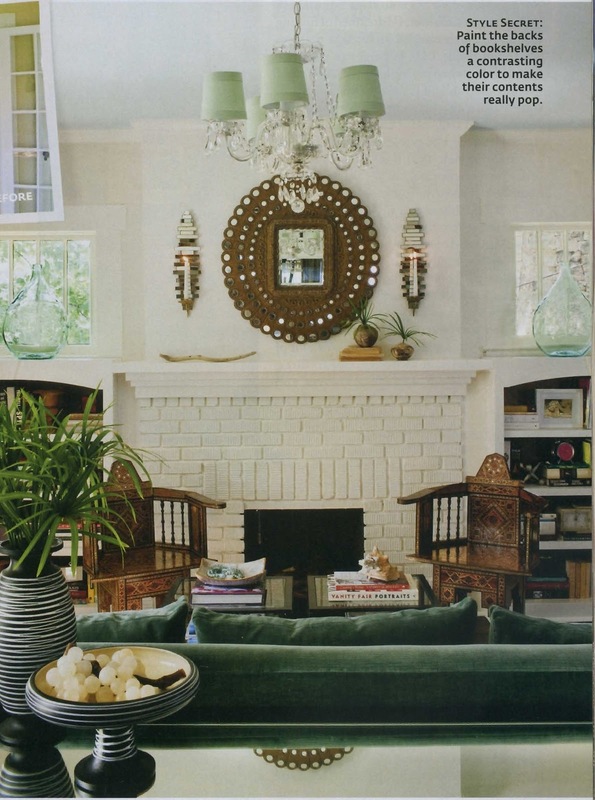 I have to say I haven't always been a huge fan of the honeycomb mirror, but it is perfect in this space! And, yes it is the Pier 1 version. Behind the sofa is a black painted console table that she upgraded by placing a mirror (instead of glass) on top of it. 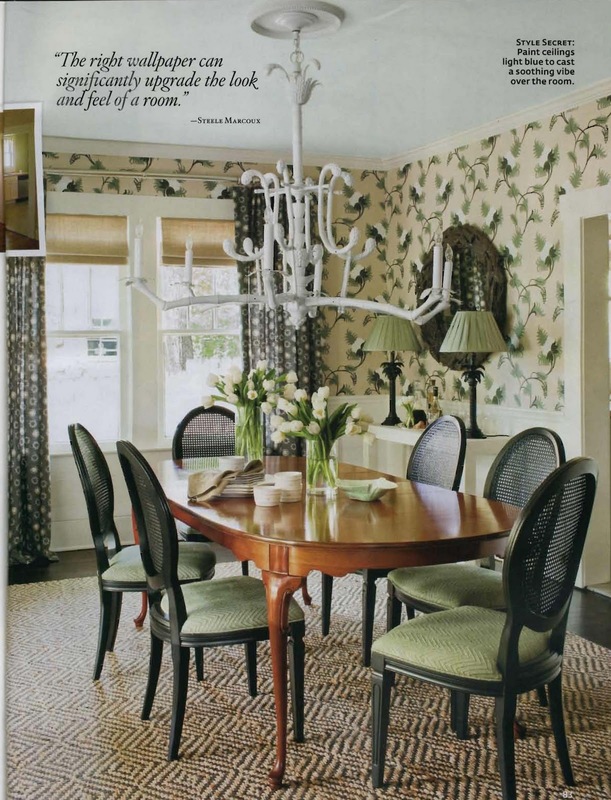 Love that custom touch and all the touches of 'green' especially the green mini shades on the chandelier. 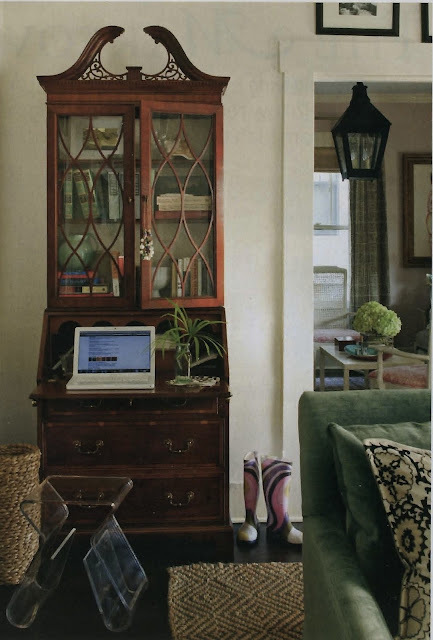 Traditional meets modern with the antique secretary paired with the lucite stool. Love it! Steele lined the inside of the secretary with a cream wallpaper to lighten it up. Brilliant! I love the color she painted on these walls - grayish pink called Calamine by Farrow & Ball. I love the camelback sofa paired with the painted cane back chairs and all the pops of pink, green and brown (note the Ziggurat curtain fabric by Quadrille?). Love the chinoiserie meets Palm Beach feel of her dining room. She introduces an unexpected pattern by adding wallpaper which is a great touch. One of the things I found amazing is that Steele and her husband had almost nothing (very little furniture and small budget) when they moved into this cottage and yet their home looks like it has been lived in and effortlessly collected over years. It's perfection if you ask me! It really is perfection! I adore the chandy in the dining room... in fact all of the hanging fixtures are awesome! I'm sure you can guess that my favorite little touch is the horseshoe over the door... sooo reminds me of my (our) families cottage up north! Such a charming home, so many great touches throughout! Thanks for sharing this here! The mix of high and low is great. Who would have guessed that Target and Pier I were sources. I fell in love with this too Fran. Just yesterday I was looking on the SL website, but the images aren't up yet. I may have to "borrow" one from you. Those mini shades on the chandelier really have me thinking. A great mix of traditional & modern. I love it all! Okay, there is nothing I would change in these rooms. And that sofa?! I would love to dive into that after a long day of work! Yes, I love it!!! I really think I could be happy in this home. I wish the West Elm jute rug was available in a larger size for my house. Great post Fran! Just stopping by for a visit after seeing you at cottage and vine. Your blog is so fresh and inviting! Oh my goodness. I SO wish my home looked like this! I am definitely going to be saving this home for inspiration. Love Southern Living. Do you subscribe? I should. Think I'm going to do it today. Thanks for stopping by and for your sweet comment! I was just drooling over this space too- and love that there are so many opportunities here to thrift/DIY to get the look for less. I'm a HUGE Steele Marcoux fan. I like the cut of her jib. I am in deep deep deeeep love with this home. Where is my Southern Living??? LOL! I want to see this in person - it better show up soon!!!! This is honestly my dream home. Everything I love. High/low, vintage, imagination, preppy, modern, chic, cottage ..... I want to move in. Isn't it fun when you find a home that you love nearly everything about? Heaven. That is one of the sweetest cottages I've seen. I.have.to.have that amazing blue couch! I loved this feature, the whole issue really. Can anyone source those pillows or fabric (on the sofa) with what looks like green palm fronds? Love them. Great post! This house is so charming. That first photo had me gawking at it for several minutes. So, so lovely! That honeycomb mirror has been growing on me. That green is probably one of the most beautiful colors ever! I love it, it just makes me so happy. I instantly snapped that photo up in to my inspiration file. Lovin' this home...eclectic yet controlled. Sometimes my eclectic can get out of control, but doesn't MCM go perfectly with ornate Victorian? Ha. fabulous...makes me want to get SL again!! i LOVE your sofa!!! would you mind emailing me the details- fabric and style???? we just moved into a new house and i would love to see the exact same one in our living room. In love with Steele's cottage. So homey and yet incredibly stylish. to brand new updates and will talk about this blog with my Facebook group. Where else may just I get that type of info written in such an ideal approach? I've a project that I am just now running on, and I've been on the glance out for such information. A lot of times it's hard to get that "perfect balance" between superb usability and visual appearance. I must say that you've done a fantastic job with this. same outdated rehashed material. Excellent read! I've bookmarked your site and I'm adding your RSS feeds to my Google account. It's beautiful price enough for me. In my view, if all web owners and bloggers made good content as you did, the internet will probably be a lot more helpful than ever before. your RSS. I don't know why I am unable to subscribe to it. Is there anyone else getting the same RSS problems? Anybody who knows the answer will you kindly respond? Thanks!! to remark on few general things, The site style is ideal, the articles is really nice : D.
Thankfulness to my father who shared with me about this webpage, this web site is genuinely amazing. Hello would you mind sharing which blog platform you're using? I'm looking to start my own blog soon but I'm having a tough time selecting between BlogEngine/Wordpress/B2evolution and Drupal. The reason I ask is because your design and style seems different then most blogs and I'm looking for something completely unique. however this post offers fastidious understanding even. hoping to give a contribution & aid different customers like its aided me. bookmarking for revisiting. I surprise how much effort you set to create the sort of fantastic informative website. Hi to every body, it's my first pay a visit of this blog; this weblog carries amazing and really good material designed for visitors. Hi it's me, I am also visiting this web page on a regular basis, this web page is actually fastidious and the visitors are really sharing pleasant thoughts. I'm really loving the theme/design of your blog. Do you ever run into any web browser compatibility issues? A number of my blog visitors have complained about my blog not operating correctly in Explorer but looks great in Chrome. Do you have any tips to help fix this problem? same time as looking for a related matter, your site got here up, it looks great. I'm going to watch out for brussels. I will appreciate if you happen to continue this in future. A lot of people will likely be benefited from your writing. Cheers! Good way of telling, and good post to obtain information regarding my presentation focus, which i am going to deliver in school.